Growing up, and even now, Beauty and the Beast has always been one of my favorite Disney cartoons. Filled with intriguing characters, a timeless story, and wonderful music – it is one that I can watch time and time again without feeling the slightest bit bored. It goes without needing to be said that a live musical version of the animated film had a lot to live up to, as I went to see it at the Fabulous Fox for the first time. Luckily it was every bit as delightful and entertaining as I could have hoped for. The story is the same as we all know and love. Belle (EMILY BEHNY) lives in a small town in France where she is the most beautiful woman around, but is also seen as a bit strange. She loves to read, and doesn’t fawn over the town’s most eligible bachelor Gaston (LOGAN DENNINGHOFF) like all of the other women. She lives there with her father Maurice (CHRISTOPHER SPENCER), an inventor who is seen by the townspeople as a crazy old man. When her father leaves to enter one of his inventions at a fair, he gets lost in the woods – only to seek refuge in an enchanted castle. Unfortunately it belongs to The Beast (DANE AGOSTINIS), a prince who who has been imprisoned there under a curse for many years. Eventually Belle goes to look for Maurice, and after finding him at the castle offers to trade her freedom for his. Luckily the castle is filled with housekeepers who have also fallen victim to the curse and want to help her. 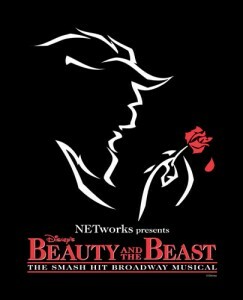 If somehow Beauty and the Beast can fall in love, the curse will be broken. All of the beloved elements of the Disney tale are there in the live version. For those like me who love the visuals and the music from the cartoon, it is amazing how they are brought to life before your eyes. All of the sets, from the town full of little shops all the way to the Beast’s menacing castle, are meticulously crafted to bring the audience a feeling of familiarity. The music, which in my opinion is some of the best out of all the Disney classics, is all there – along with some new songs. But it just doesn’t get much better than seeing “Be Our Guest” come to life before your eyes, complete with singing and dancing silverware and kitchen utensils. This is one of the biggest spectacles of the show, and is quite a sight to behold. Another great performance to be noted is “Gaston,” which brings together almost the entire cast to celebrate the brutish character in a fantastically choreographed dance number in the tavern. When you’ve grown up with a story your entire life, it is hard not to compare actors to the original cast that you know and love. In this musical version of “Beauty and the Beast,” the actors for the national tour were brilliantly chosen for their roles. 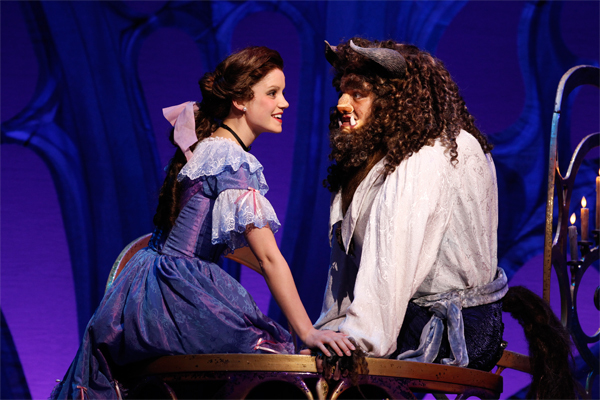 Emily Behny, who plays Belle, has the look and voice to live up to her character’s name. There were times at the end of certain numbers when I just thought, “Wow,” after hearing her beautifully powerful voice. Dane Agostinis does a fantastic job as The Beast, who is a difficult character to portray. He balances a perfect combination of intimidation, humor, and passion for the role and is able to change gears at the drop of a hat. One of the other main characters who clearly steals the show whenever he is on stage is Gaston, played masterfully by Logan Denninghoff. If there is one actor who captures the character from the cartoon one-hundred percent, he is hands down the winner. Everything from his look, to his voice and demeanor on-stage, perfectly captures everything that Gaston is. Denninghoff has one of the most powerful voices in the show, and his performance is one of the most entertaining parts of the show. Gaston is a great character, and I am so glad that they were able to capture everything that is despicable, yet hilarious, about him on stage. Belleville, IL native Andrew Kruep should not go unnoticed as his bumbling sidekick Lefou, who also does a great job capturing his character. Kruep’s look is completely transformed into Gaston’s chrony, with a look that I thought possible only in a cartoon. Their chemistry together is great, and creates many laughts throughout the show. There are so many great characters in the show, and the entire principal and ensemble cast do an incredible job bringing them to life. Two other performances to be noted are those of Michael Haller as Lumiere and Benjamin Lovell as Cogsworth. The two of them pretty much narrate the show after we get to the castle, and they are able to make things very fun and entertaining. These two also are able to capture their beloved characters from the classic cartoon with ease. Really, I can’t think of anyone in the cast who didn’t do a great job with this. Julia Louise Hosack as Mrs. Potts and Jen Bechter as Madame de la Grande Bouche are fantastic as well. If you love the Disney film, have no worries that this live musical does everything right. Bringing something animated to life and getting it right is no minor feat, but “Beauty and the Beast” does it in a way that is sure to please fans of the film. It’s a great show for kids and adults alike, and it is hard to believe that anyone in the audience left without having a great time. 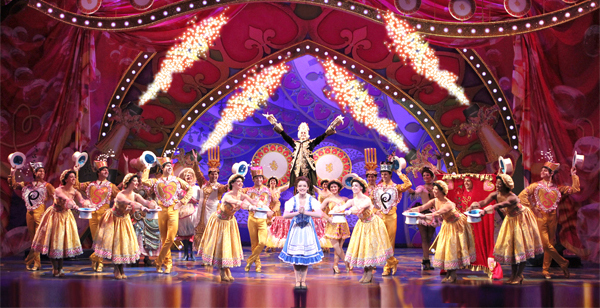 This is one show you definitely don’t want to miss while it’s still in town, and what better place to “Be Our Guest” than the Fabulous Fox Theatre.